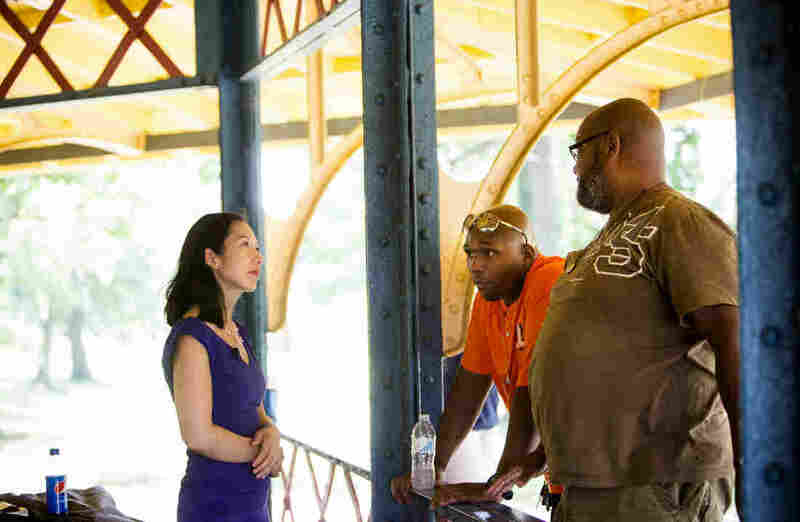 Crime Interrupts A Baltimore Doctor's Reform Efforts : Shots - Health News Dr. Leana Wen came to Baltimore as health commissioner to combat the city's longstanding problems with violence, drug addiction and health disparities. She finds that solutions don't come easy. Workers for the Safe Streets violence interruption project including Gardnel Carter, center, talk with Baltimore residents in 2010. On a hot, sunny Monday in mid-July, Dr. Leana Wen stood on a sidewalk in West Baltimore flanked by city leaders: Mayor Stephanie Rawlings-Blake, interim police commissioner Kevin Davis, Rep. Elijah Cummings. Under a huge billboard with the web address dontdie.org, she proudly unveiled a 10-point plan for tackling the city's heroin epidemic. Wen, the city's health commissioner, said she aims to create a 24/7 treatment center, an emergency room of sorts for substance abuse and mental health. She spoke of targeting those most in need, starting with those in jail. 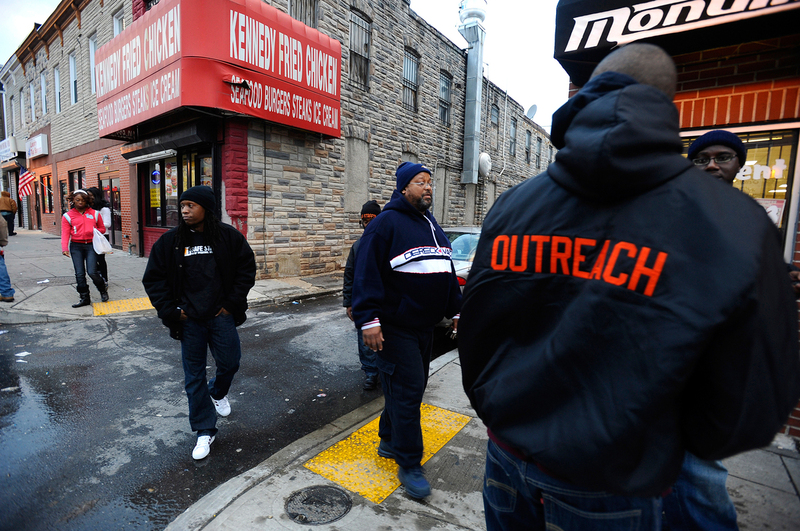 What Wen did not know was that, across town in East Baltimore, police had hours earlier arrested two workers with Safe Streets, the health department's flagship anti-violence initiative. The project, first launched by the health department in 2007, hires ex-offenders to go into the streets and mediate conflict before it erupts into violence. They're called violence interrupters. It's based on the Cure Violence model out of Chicago. The workers have credibility in their communities because they are from those communities. Some have histories in the drug trade, and many of them have served time in prison. What had happened was that in the wee hours of the morning, police responded to a call about an armed robbery. They chased the suspects to an address which turned out to be a Safe Streets neighborhood office. Inside, police found guns, drugs, and paraphernalia related to the manufacture and sale of drugs, including sifters, cutting agents and scales. Nine people were arrested, including Two Safe Streets employees who face gun and drug charges. It wasn't the first time Safe Streets workers had gotten into trouble. And Wen says she knows there are risks in hiring ex-offenders. "But everything has risks," she says "In my work as an ER doctor, there's no procedure that I can recommend, no medication I can recommend that doesn't come with a risk." Research shows Safe Streets does deliver. Last year, the health department says the program mediated 880 conflicts in Baltimore. Until recently, a couple of the neighborhoods they operate in had gone a year without a fatal shooting. At the time of the arrests, Wen and the health department were preparing to announce the opening of a fifth neighborhood site for Safe Streets. There was talk of it opening in Sandtown-Winchester, Freddie Gray's neighborhood. Instead, Wen appeared at a press conference at police headquarters, this time flanked by the police commissioner and federal agents. She reported that the raided Safe Streets site had been suspended and that two employees had been fired. She strongly defended Safe Streets as a program, and spoke of standing united with the police and partners in reducing violence in Baltimore. Her words had been chosen carefully. But there were problems. She soon learned from her deputy Olivia Farrow that the Safe Streets staff was not happy. Part of the problem was the image. "People were upset to see me standing with the police in the first place," Wen told us. "Because the entire point of Safe Streets is that they're separate from the police, and in the mediation for conflicts, there has to be total trust. And we had potentially interfered with that relationship." So she sets about trying to fix things. She calls a meeting with the Safe Streets site directors. She brings in Brent Decker from Chicago's Cure Violence, who trained many of the Baltimore staff, as well as violence expert Daniel Webster from Johns Hopkins University. They talk about what could be done differently to keep staff from falling back into their old patterns and getting involved with drugs and crime. They discuss providing more counseling for the staff, who themselves have been perpetrators and victims of violence. Wen then turns the conversation to a topic she'd heard about in one of her early visits to the program. "Initially when I was meeting with Safe Streets, I said, 'What is the one type of support we can help you with?' And I thought they were going to say trauma debriefing, mental health support. And they said child support." That puzzles her. She wonders why she would be helping with child support in the first place, and also just how that would be done. Dante Barksdale, Safe Streets' outreach coordinator, explains that most of the guys coming to work for the program are over 30, which means they're likely to have children. Many owe upwards of $50,000 in child support. The Safe Streets jobs pay about $28,000 a year. A couple months after they start working, the state starts deducting child support from their paychecks, leaving them with very little. Most of these men have never held jobs before and don't have the skills to find other work. All of these factors make for a very stressful transition to legal employment. "We see that a lot," Barksdale says. "That translates through all the sites." Dedra Layne, who oversees Safe Streets at the Health Department, proposes talking with the bureau of child support enforcement. "If they don't know that we're faced with this issue, they can't do anything," Layne says. "We should at least be having the conversation about are there any options to consider. Are there any things that we can put in place that would support the staff as they move through their first employment opportunities and still have families to manage." What started as a conversation about preventing violence has now wandered into the realm of child support law, further and further away from what many might think of as public health. But Dr. Wen pushes on. Leana Wen talks with Safe Streets outreach workers Dante Barksdale and Gardnel Carter in Druid Hill Park in Baltimore. "Have there been, around the country, efforts to do different types of salary arrangements to bypass the child support problem?" she asks. "An example might be instead of paying child support directly, have there been experiments to see what happens if we pay for housing?" Heads nod around the table. They don't know if it will work, but the sense is it's worth looking into. No one here would argue that child support isn't important. In a different story, we might be using the term "deadbeat dads" to describe this problem. But what do you do when your deadbeat dad is someone who voluntarily puts himself in dangerous situations for the good of the community, wedging himself between people who literally want to kill each other? What do you do when your deadbeat dad represents your hope for the city, if only he can stay on track? These are the questions that Leana Wen is wrestling with. And like so many other questions in Baltimore — there are no easy answers. NPR and All Things Considered will continue reporting from Baltimore in the coming months, checking in with Leana Wen and her team periodically. Stay tuned for future stories.